Not bad. It took me six Carvin guitars, a Carvin bass, and four Carvin amps (one's gone now) before I made it! spudmunkey wrote: Welcome back, Elfdude. Wait. What? Elf made 10,000 on 1/30/15. Today, 8/23/16, he has 10,001. ??? When the amp forum was spun off, everyone's post count got trimmed. Ah, that makes sense. I like when there's good reasons. Thanks! Not at only 2.38 posts per day, you're not. spudmunkey wrote: Not at only 2.38 posts per day, you're not. 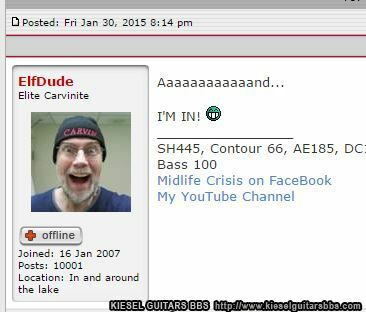 spudmunkey wrote: When the amp forum was spun off, everyone's post count got trimmed. feel like I used to post here a lot, but no where close to you guys. I guess for most of my previous years, I spent on the carvinmuseum forums. Yeah, and there were definitely guys that were prolific members in previous versions of the forum, too. A shame that history couldn't be preserved. I don't post as much as I used to either. Maybe now that I have a whole bunch of different kinds of Carvin guitars, I just don't have as many questions or burning desires as I used to. But I'm still a ridiculous fan boy. ElfDude wrote: I don't post as much as I used to either. edit: OK, to clarify so it doesn't sound like I'm a post-counting stalker, I happened to see that you were at 10,032, and I was all, "Huh...I feel like ElfDude's posted more than 32 times since I remember him crossing 10,000 again...I wonder..." and then I approximated the number of posts since that day, and it was about 230-ish. Last edited by spudmunkey on Fri Nov 18, 2016 11:10 pm, edited 1 time in total. I keep forgetting this thread exists. Still one of the loneliest clubs. Well, 10,000 posts is a lot. Doctor Turn should be joining us in no time.